Why I developed Diamond Dash Bot? I created this as a programming challenge, not to cheat to achieve a high score. The goal is to achieve a maximum score within the given 60 seconds without powerups. The best I achieved so far is 2.6 to 2.8million (before score bonus). There is still possibility to improve the algorithm. I’m aware of time cheat hacks but going down that road becomes (more) pointless. 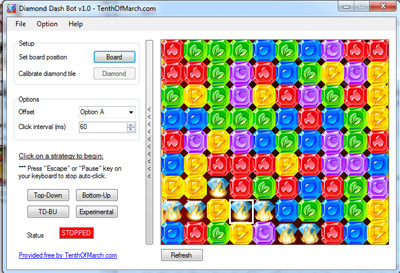 You need to configure the Diamond Dash Bot application at least once, provided that the location of the game board does not change from its previously configured location. You need to calibrate the diamond tile at least once, provided that the Offset option has not changed. Under the Setup panel, click on the Board button. A white outlined square will appear. 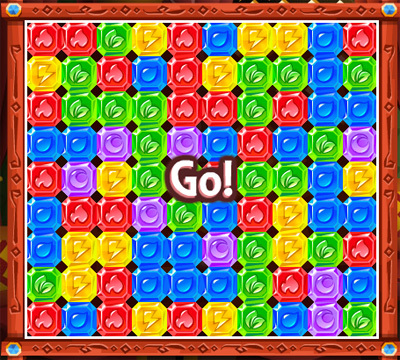 Move your move over the Diamond Dash board so that the square covers all tiles. Click the left mouse button to confirm the board location. Check the panel on the right to ensure all tiles are within view, reset the board position if necessary. Under the Options panel, select an OffSet value. You can leave this to the default “Option A”. The Click interval indicates how frequent the program will attempt a (in some options, a few) click(s). The interval is in milliseconds. To begin the auto click process, click on one of the 4 strategies (ie. Top-Down, TD-BU, Bottom-Up or Experimental). When the program isn’t clicking on diamond tiles, or only clicks them when they are in a group of 3 or more, you will need to calibrate the diamond tile. Under the Setup panel, click on the Diamond button. Click on the diamond tile on the right panel (a small white outlined square will appear around the tile). When the program isn’t clicking on the Plasma Burst tiles, follow the steps above (same as Diamond tiles) by clicking on the PlasmaBurst button. IMPORTANT: To stop the auto click process, press the Escape or Pause/Break button on your keyboard. Top-Down: Searches for a match from top to bottom. Bottom-Up: Searches for a match from bottom to top. TD-BU: Search for a match from bottom to top and top to bottom concurrently. Experimental: Searches for up to 5 matches from top to bottom concurrently. [4-Sep-2012] V1.1: Added calibrate Plasma Burst button (unlock after reach Level 7 in Monster World). Thanks nick! Leave a comment below for feature, enhancement, or bug request. A while back, I received a gogopal Q4.3 Personal Navigation Device unit for review. The unit has maps for both Malaysia and Singapore. In the box you’ll find the GPS unit, car cradle, car charger, USB cable and pouch. One noticeable item missing from the list is a house charger. I later find out that it comes together only with the Q5.0 version. You can purchase it separately from gogopal at RM30. The navigation system is powered by Korea’s top navigation software — SpeedNavi. Its Malaysia and Singapore maps are provided by MapIT, which also supplies the two country’s maps for Google Maps. The gogopal Q4.3 GPS unit runs on Windows CE 6.0 OS. Apart from the GPS navigation software, the unit comes with music and movie players, photo viewer, eBook reader, games and flash player. It also has some miscellaneous tools like note, calculator and calendar. On the map layout screen, tap the bottom bar to show customizable shortcut icons to other menu items. To start navigation, you can tap on the bottom bar to bring out shortcut links to saved home, office or favourite locations. 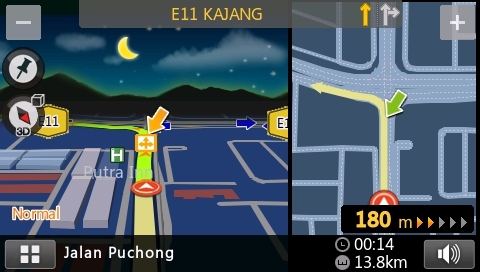 The GPS navigation software’s UI is available in 11 languages including English, Chinese, Malay, Japanese, Korean, Indonesian, Thai, Vietnamese, Spanish and French. Its voice navigation is available in 9 languages including English, Chinese, Malay, Cantonese, Japanese, Korean, Thai and Vietnamese. You can search any location by point-of-interest (POI) name, address, postal code (Singapore only) or nearby amenities. One thing I like about their text search option is their ‘auto-discover’ feature. 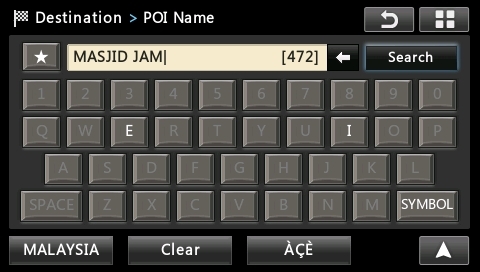 As you type, the letters on the virtual keyboard enables/disables itself to identify the next possible letter. That way, you will never hit a “no result found” popup. When you search for a POI name and it returns a massive amount of result, you can further refine search result by tapping on the ‘City’ button. You can then select the state and city of the location you are looking for. 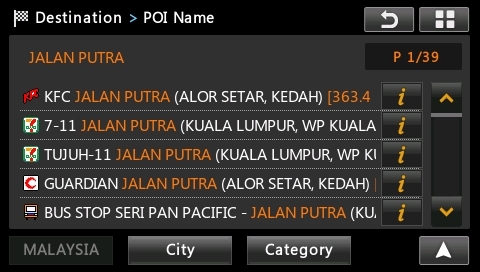 The final result will only display the POI from the selected city. 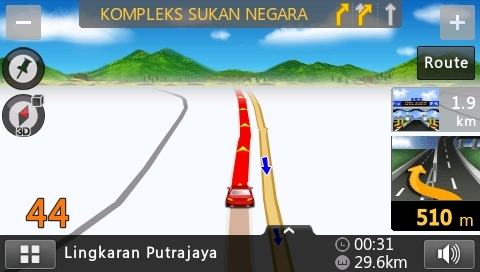 During normal navigation, there will be indicators on the right that shows the distance of the upcoming 2 turns. One feature that places SpeedNavi above my existing GPS software (hacked google maps on Android) is the availability of ‘junction view’. As shown in the screenshot, a big arrow indicates the path that you need to take for the next turn. This eliminates guessing and improves safety. When you are approaching certain checkpoints, the navigation display may split into 2 horizontal panes. The new pane on the right will show a top-down bird’s eye view of the next turn. 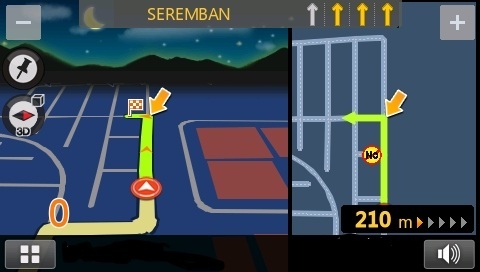 Apart from the recommended route, you may press the ‘Route’ button to bring up other route options such as ‘Avoid highway’, ‘Shortest’ and ‘Highway’. If you would pass through a particular route, you may tap the location on the map and select the ‘Way Point’ button. There is a ‘Toll Road’ option under the settings –> route menu. You can set this to avoid, allow or ask me. When set to ‘Ask Me’, SpeedNavi will then ask for your confirmation each time you set a new destination that may pass through a tollgate. SpeedNavi has a speed limit warning feature. You get alerted when you exceed the speed limit in that area. At times when you are approaching a turn, it may give out a continuous beep accompanied by a blinking icon on the map to prevent you from making a wrong turn. Besides that, you will also get a voice alert whn you are approaching a sharp bend. All these features can be turned on / off in the settings. The Q4.3 version has a RRP of RM299. Meanwhile, the Q5.0 version has a RRP of RM499. The SpeedNavi system delivers most functionality a user should need. I am happy with the ease of use and multiple options to search for any location — the POI search is particularly useful. I am confident in the completeness and accuracy of the map provided since MapIT provides maps for the widely used Google Maps as well. If you are interest in buying a gogopal GPS unit, you may check out their online partners. Some people may be experiencing major broadband issues with Streamyx lately. This is due to problems with some submarine cable affecting the network between Malaysia to Europe and US. Repair works have begun and is due to complete on 2 May 2010. This problem has been affecting my broadband network stability for the past few days. At times, I cannot access any websites at all. At best, things would work for a few minutes and stop again. I have just received an email tip from my hosting company — ServerFreak — on how we can temporarily solve this problem.